After getting called out for some of her comments, Eva pretended to have amnesia. When that didn’t get her out of hot water, Eva asked Kandi for advice. 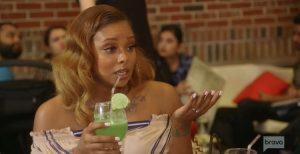 “I know that some of the girls feel like you say one thing when the people aren’t around, and then when the people are around, then you don’t say that same thing,” Kandi said. Wait –isn’t that a requirement to be a Real Housewife? Then, Eva criticized the fact that Kandi and her posse often discuss people that they don’t like, but then don’t classify their own comments as shady. I wonder if Porsha Williams and Dennis McKinley feel shaded by Kandi and her squad? I bet that they do. “I think it’s extremely hypocritical in this group, for Kandi, Porsha, or anyone to look at anyone else and call them shady,” she said. Eva also had something to say about the ever-changing mood swings on RHOA. “One minute you’re super hot, and then the next minute your ice cold. And there is no prediction of this weather…like at all. It flips at the drop of a dime, and I’m not used to it.” Is Eva being shady enough to secure a peach for next season? Only time will tell! TELL US- IS EVA THE SHADIEST RHOA CAST MEMBER? DO YOU WANT HER TO COME BACK FULL-TIME NEXT SEASON? WHY DOESN’T EVA OWN HER SHADY COMMENTS?